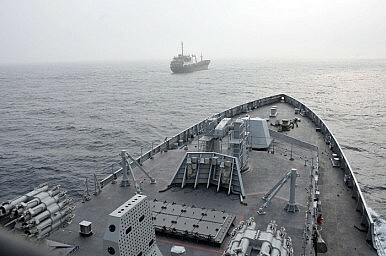 Chief of India’s Eastern Fleet said the naval exercises epitomize the strategic relationship between the two countries. On Monday, the naval portion of India and Russia’s Indra exercise began in the city of Visakhapatnam in Andhra Pradesh. The exercise will run from December 7 to December 12 and include two phases, a harbor phase and an a sea phase. India and Russia have been engaging in bilateral naval exercises since 2003 and this is the eighth edition of the Indra exercises. In November, 250 Russian soldiers traveled to Bikaner, Rajasthan, where they joined their Indian counterparts for the land part of the Indra 2015. Those exercises focused on joint peacekeeping and counterterror operations in desert climes. The naval phase features four Russian Navy ships from its Vladivostok-based Pacific Fleet: a guided missile cruiser, the Slava-class Varyag; a destroyer, the Sovremennyy-class Bystry; a tanker, the Boris Chilikin-class Boris Butoma; and a rescue tug. Such an event isn’t quite a hypothetical. Piracy is a serious issue in the Indian Ocean region, particularly off the coast of Somalia. But terrorists have had bad luck trying to turn pirate. In September 2014, Al Qaeda in the Indian Subcontinent (AQIS) tried (and failed) to steal a Pakistani frigate in the port of Karachi. The chief of India’s Eastern Fleet, Rear Admiral SV Bhokare, said the naval exercises were aimed at increasing interoperability and strengthening ties between the two navies. He reportedly said that the exercises epitomize the strategic relationship between New Delhi and Moscow. India has been one of the leading buyers of defense equipment in recent years, much of it from Russia. According to SIPRI’s 2015 Yearbook, from 2010 to 2014 India led the world in importing major arms. Russia, in that same period, accounted for 70 percent of India’s arms imports. Globally, Russia ranked second for arms exports after the United States. Benjamin Baker explained in November that “since the end of the Cold War, Asia has been Russia’s largest market for weapons’ exports; 60 percent of all Russian arms exports have gone to Asian states, with India and China in particular commanding a large percentage of these orders. As a share of total Russian arms transfers from 2010 to 2014, India and China represented 39 and 11 percent, respectively.” But, he noted, Indian observers have raised concerns about dependence on Moscow for defense materiel. In addition to feeding an indigenous defense industry, part of Prime Minister Narendra Modi’s “Make in India” initiative, India also has the option (not as open to China because of Western sanctions stemming from the 1989 Tiananmen Square incident) to shop elsewhere. New Delhi and Moscow are set to deepen bilateral defense ties in the coming years. India, Russia to Upgrade Joint Military ExerciseIndia, Russia Conclude Major Military ExerciseIndia, Russia to Kick Off Major Military Exercise This WeekIndia, Russia to Hold Joint Naval ExerciseHas Russia Lost Patience With India?